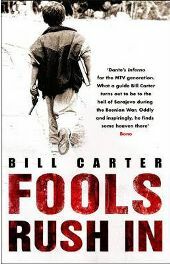 When American Bill Carter found himself needing some excitement he managed to get himself a place on one of the volunteer aid convoys taking food and medical relief into the besieged town of Sarajevo during the bitter war in the former Yugoslavia. He knew little about the reasons behind the war but he realised that it didn’t matter; people were suffering and he risked his own life to help others. Since they were volunteers rather than official aid workers Carter and his colleagues did not have UN “Blue Cards” – this meant that in the event that they were kidnapped or in other serious danger, the UN troops would not have to help them. Arriving for the first time in Bosnia he realized that the television news was not telling the whole story. “Tell me, why are they killing all the Serbs in Sarajevo? She asked. When Carter heard that a friend based in Croatia was heading for the U2 show in Verona, he hatched a plan; and so begins the final third of the book. This section explains how Carter persuaded U2 to get involved, how he mobilized his friends in Sarajevo’s battling artistic community and how he brought the plight of the people of Sarajevo to the attention of the world’s media; no longer was this a purely military campaign, it was about ordinary people who weren’t bearing arms against each other. Bono’s description of the book as a “Dante’s Inferno” is perhaps a little over the top; a literary masterpiece this is not. It is however, well written which, I believe, is a different matter. Carter manages to convey not only the horrors of what he sees in a simple yet effective way but the tenacity, dignity and the unfailing humour of the besieged citizens of Sarajevo. Every few chapters, Carter intersperses the story with scenes from his own life – his childhood, his travels and his relationships. Personally, I could have done without these parts and I didn’t think they added much to the story. I felt that the story in its own right threw up more than enough thinking material. However, it is pretty clear on reading them why the author chooses these particular scenes from his past and they do have some resonance in the present. As an account of one man’s experiences during the war it ends somewhat unsatisfactorily; I feel that the problems with the ending stem from the split in the story. For me, Bill Carter seems to extricate himself from the war too easily and he appears selfish and mercenary. Anyone reading the book because of the U2 connection may feel dissatisfied at the amount of the book given over to that part of the story. To please me, Bill Carter would have written two books; the first a full and frank account of the time he spent in Sarajevo as an aid worker, the second an account of the U2 business. That said, this is a gripping and exciting story; Carter paints a picture of a resilient and humorous town, with pockets of beauty around the backdrop of war. He writes of the people he met with warmth and fondness and I found they quickly became as important to me as they clearly were to him; I do not think I will ever forget the tragic scenes involving Achman, the teenage lad who helps out the convoy workers. “Fools Rush In” is recommended to educate, enlighten and entertain at the same time – doesn’t that make it worth a read? No Comments on "Fools Rush In"